When you fly from Gatwick Airport, unless you are flying internally to the UK, you will probably be flying to a location that does not use the Great British pound. Therefore, you will need to arrange to either exchange some currency, buy travellers cheques, sort a prepaid currency card or arrange an international debit or credit card so that you can make the most of your hard earned money while you are away. To get the best exchange rates you are best to exchange your money or get an international credit card before you get to Gatwick Airport and head off on your trip. You may discover that most currency outlets offer a slightly different currency exchange rate for your destination and these rates can change daily! There are also a variety of payments options to chose from so do your research to get the best deals. Find out more about the best tips and tricks on our Tips page! What currency exchange to use? Moneycorp is stationed at Gatwick Airport in both the North and South terminal. Their daily exchange rates are displayed on boards that are automatically updated 24 hours a day. It is usually more expensive to buy your foreign cash at the airport than to purchase it beforehand, although you might be able to order cash from Moneycorp online and collect it at the airport to take advantage of their online deals. Another way to get your foreign currency is by ordering in advance from a site such as Travelex. Usually you can get a better rate online, so by ordering in advance and having the cash sent to you you will save a lot of money. You can also pick it up in person if you have a Travelex store locally. It may also save you stress as well as some currencies may be more difficult to get hold of and may not be available to purchase at the airport, so if you order before you travel then you won’t have this concern. Make sure you don’t just use any online site to order your currency from, make sure you use a trusted currency provider, such as Travelex who have been in the business since 1976! With a prepaid currency card you can transfer money from your bank account to the card and receive that day’s exchange rate for your cash. The cards can then be used at ATMs at your destination or used instead of a debit card. You can usually top up your card online or by phone. What you do need to watch out for are the ATM fees and “inactivity fees” when you do not use your card for a while, these charges may make the original saving from the low exchange rate obsolete. There can also be fees for using the card within the UK as they are specifically aimed at use abroad. The cards are safer than carrying cash but you will need to order them in advance of your trip to ensure you get them in time. Using a credit or debit card while you are away may make spending easy, but it is difficult to know exactly what you are spending and it could cost you more money. Overseas credit cards are the best for saving money as long as you make sure you do not use them in the UK. You also have to make sure you pay off the balance in full every month so you do not incur any interest fee charges and do not use your card to withdraw cash as there is often additional fees for this privilege. Most countries require you to declare any large amounts of cash that you may be carrying. In the UK you must declare any cash you are carrying equal to or above €10,000 or the equivalent currency if you are entering the UK from a country outside the EU. This is the law and failure to declare large amounts of cash may result in prosecution. It should be quite straight forward to declare any cash – you just needs to find customs which should be clearly signposted. At Gatwick Airport customs is located as you exit the airport and the red channel is used for declaring large amounts of cash. To pre fill the form required please visit the HMRC government website. Use a bum bag to carry cash, preferably one that is flat to your body that hides underneath your clothes. If you have a handbag make sure it has a zip and you keep the bag in front of you. If you keep your money in a rucksack do not have it near the top of the bag – keep it buried underneath. Take travellers cheques if you can as they are easily replaced if they are stolen by calling the emergency number provided by the company. If you are taking cash then ask your currency exchange provider to give you smaller notes where possible. If you have only €50 cheques and try paying for a croissant you may catch the eye of a thief. Split up your cash if you can. Do not leave cash in your hold luggage in case your baggage gets lost in transit. Try to blend into your location so you do not look like a tourist – make sure you plan your route before you travel. If you are staying in a hotel or villa and there is a secure safe use that during the day and only take out as much money as you need for that day. Do not leave handbags or wallets. 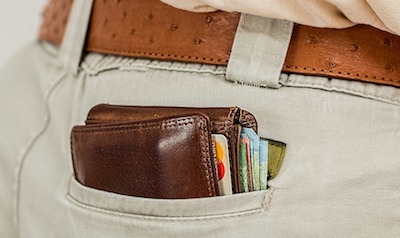 Do not keep your wallet in your back pocket. Do not be distracted by street artists who may distract you while a companion pickpockets you. Take out travel insurance that covers your cash. If you are a victim of theft you must report it to the local police straight away and get a crime reference number. You will then need to contact your travel insurance with the number in order to make a claim. Visit Crimestoppers UK for further advice on avoiding pickpockets.